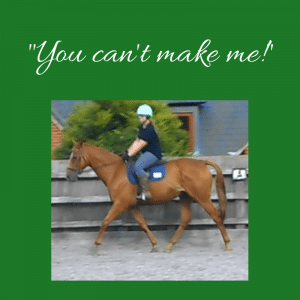 Horsey Stuff • Our Progress"You can't make me!" With the deadline looming (tomorrow) for EquiMind entries. I reverted back to my old habit of leaving it to the very last minute to get my test filmed. In my defence, this month we have had plenty of reasonable excuses including, but not limited to; my sore knee, Scottie’s sore back and me starting a new job. These things have all led to more time off and light work than we really needed. Despite all of this, Scottie has been schooling beautifully since having his back done. However, today Scottie just didn’t fancy it. He didn’t want to work properly, using the banners (which have been up nearly a month) as the perfect excuse to spook rather than work. After he realised he couldn’t get away with spooking at the banners he has ridden past for the past month, he still didn’t want to work properly, deciding that chomping the bit and being a giraffe was a much better thing to do. Nothing I did changed this, although pushing him through it and cracking on did stop some of the giraffe impressions. So keep your eyes peeled for this months EquiMind write up! But today’s frustrating antics got me thinking about one of the biggest arguments about horse sports, racing in particular, and that argument is: if they don’t want to do it, you can’t make them. This is an interesting argument and as much as I believe this statement, when I really think about it, it’s not that straightforward. I make Scottie do lots of things he doesn’t really want to do. I make him do things what scare him or things he finds boring and he generally responds fairly willingly. He doesn’t want to do these things, but he does trust me and wants to do what I am asking him to do. However, as ‘easy’ as it can be to move Scottie in a direction at a speed I want, asking him to carry himself or use himself properly is a very different matter. If he isn’t in the right frame of mind, he won’t do anything he finds challenging or too tiring. He will trot around the school fine, but he won’t work in an outline or bend or use himself. Yes occasionally if I keep nagging he gives in, but sometimes if I keep nagging it gets worse. So in this sense, no I can’t make him do something he doesn’t want to do. From a sporting point of view, I do stand by the above statement. But it varies massively from horse to horse and in each situation. So it could easily be interpreted the other way too. 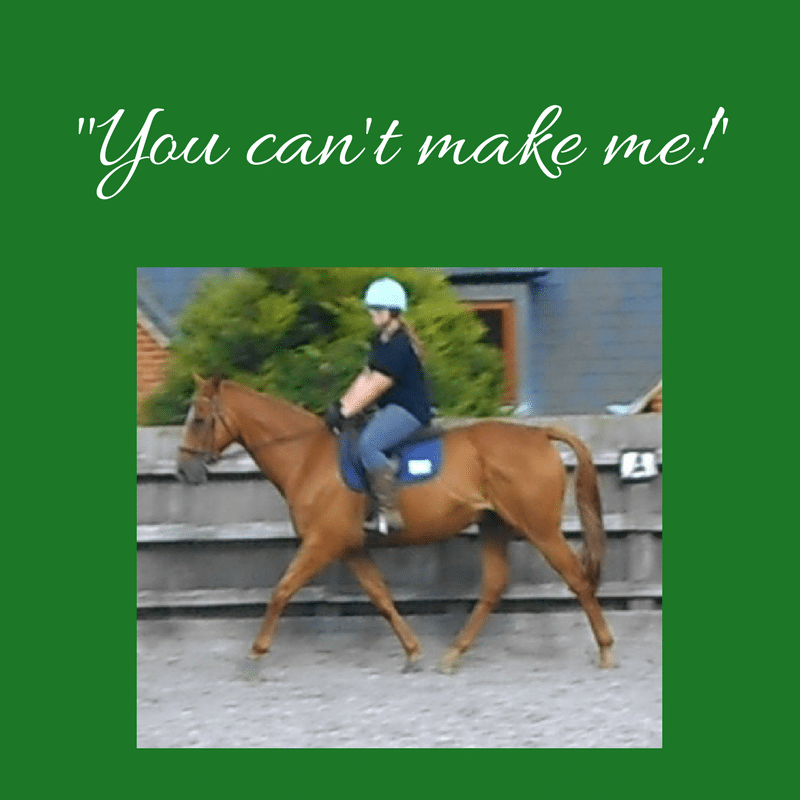 Do you agree that you can’t make a horse do something they don’t want to?